Yorkshire Terriers, also simply referred to as Yorkies, are lovable pups that are known for their small stature. As a full grown adult, most only have a shoulder height of approximately eight to nine inches. With their petite size, it can be difficult to keep track of how they grow and develop. Yorkies tend to grow rapidly in the early stages of their life. While it may seem like they have stopped growing, these pups are fully capable of getting bigger as the years go by. To get a better idea of when your pup will stop growing, you need to understand their development cycle. Experts in the field have identified four distinct developmental stages that cover the first couple of years of life. These stages include various spurts of growth and can be used to get a better idea of what weight your dog should be at. It should be noted that the information is common for the breed. Certain outside factors and genetic disposition can affect how your Yorkie grows. This stage starts from the moment your puppy is born and will last from approximately six to seven weeks of age. This is when they'll start to open their eyes and learn how to walk. On paper, growth is minimal. However, to a dog of this size, it's noticeable. They'll grow to approximately a quarter of a pound or 0.14kg. This is a rapid growth period. The puppy stage is defined as seven weeks up to six months of age. Your new canine companion will start to develop new personality traits and explore the world around them. It's at about this time when you should start to train them. It's when they're most capable of learning new behaviors. 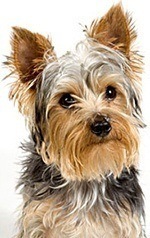 In terms of size, most Yorkies will grow to about two and a half pounds or 1.13 kg. Yorkies are considered to be youngsters from six months of age up to ten months. At this point, your dog will have already started to pick up the signature Yorkie traits. They'll start to grow their hair long and have plenty of energy to play. At the end of this stage, they'll almost double their weight to 2.04 kg, or four and a half pounds. At this point, Yorkies are considered to be adults. However, that doesn't mean that they'll stop growing. This developmental stage lasts to about two and a half years of age. Their weight will gradually increase. Growth is a slower process at this age, so you may not even notice that they are growing. Yorkies are considered to be full-grown adults at four years old. They should have reached the average weight of approximately six and a half pounds, or 3.17 kg. Generally, this is considered to be the point at which Yorkies stop growing in height. If you measure their height at their withers, this will typically remain the same throughout their life. While Yorkies may stop growing in height at four years old, they may change in size well into their adult years. Weight plays a big factor in their overall size. Even a tiny bit of weight gain can affect the way they look. It may appear that they're still growing, but a measurement will tell you that they're the same height. It's important that you stick with a healthy diet and exercise plan throughout your dog's life. Yorkies are prone to weight fluctuations. Changes in appetite and lifestyle will lead to changes in how they eat. You need to keep a constant eye on their diet and make changes accordingly to avoid major size changes. What If My Dog's Size is Bigger or Larger? Not every puppy is going to develop the same way. Genetics and certain environmental factors can cause your dog to grow differently than the norm. In most cases, there's no need to fret. If your dog doesn't reach a healthy weight by the time that they're four years old, they'll likely continue to grow until they do. If your dog weighs more than the average four to seven pounds, that's perfectly fine too. Many Yorkies can grow upwards of 15 pounds or more. It may mean that your dog isn't a purebred. You can get a better idea of how large your pooch will get by monitoring their growth and performing a few simple mathematical equations. If you're worried about your pup's development, take them to a vet. They'll be able to see if your dog is growing properly or if you need to make some lifestyle changes to keep them healthy. As mentioned earlier, there are many reasons why your dog may not be following the same development path as other Yorkies. Several factors can affect how big your dog will get and when they'll stop growing. Like with humans, genetics play a big role in how your dog will grow up. If you got your canine companion from a breeder, you should be able to get information about their parents. You can compare measurements and get a general idea of how things will play out. You may even be able to see them for yourself so that you can get a better idea of how tall and large they'll be. Genetics will affect your dog in different ways. Some genes are stronger than others. Your pup will take on traits from both parents, but sometimes, one parent's genetics will have a bigger effect than the others. What your pup eats has a huge effect on their body. Not only will it determine how girthy your dog gets, but certain ingredients can also change bone growth and other internal factors. You should always feed your Yorkie a high-quality kibble. Dogs with a balanced diet filled with all the essential ingredients they need to stay healthy will almost always grow faster than one that's eating a cheaper alternative stuffed with fillers. Your dog's food should be high in protein. This especially true for young puppies in the crucial developmental stages. High-quality protein sources are filled with muscle-building amino acids. In addition to plenty of protein, your dog is going to need calcium, vitamins, minerals, and much more. With the right formula, your dog will develop into a healthy dog with good bones, strong muscles, and beautiful hair. Their diet can also lead to too much growth. You need to feed them the appropriate amount of food each day to prevent obesity. An overweight Yorkie is susceptible to a host of health problems. If they get too heavy early on in life, it can also change the way they grow. Their bones may shrink under the pressure of increased body weight. Exercise is crucial for any dog. 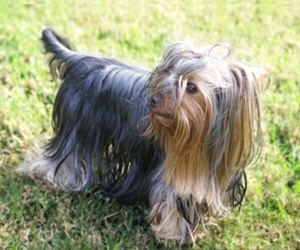 Yorkies have considerable energy and will likely stay active throughout the day. However, you should do your part to help them exercise. It's recommended that you take your Yorkie on two 30-minute walks each day. This will help them expend energy and develop important muscles throughout their bodies. Regular exercise can help them stay in shape and will aid in the development cycle during the first few years of life. If your dog continues to gain height after their fourth year, they may be suffering from a condition known as acromegaly. Dogs with acromegaly have a pituitary gland problem. It will release too much growth hormones, causing them to grow beyond a healthy size. A veterinarian will be able to perform tests to diagnose the problem. They may also create a treatment plan to stunt growth so that your furry friend can stay healthy. Changes in your dog's size will stop once they become seniors. For Yorkies, this stage of life typically occurs between eight to ten years. Some dogs may enter this stage earlier depending on their overall health. Senior age is identified by deteriorating health. They may start to experience medical complications. In most cases, getting old is marked by a decrease in activity level. Your dog may spend more time sleeping and lounging around. It's important to adjust their diet based on this change. If you continue to feed them the same amount of food as a young adult, your dog may gain even more weight and suffer from heart issues. As a recap, Yorkies usually reach their full height at around four years old and will stop changing in size altogether when they're seniors. You'll notice the most growth in their first couple of months of life.